Alan Shearer might not have been at St James's Park last night - but that didn't stop him from joining in the celebrations. If you needed reminding, Newcastle United came from behind to beat Premier League champions Manchester City - opening up a crucial five-point gap over the relegation places. 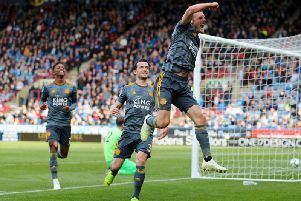 Things looked bleak after the Magpies fell behind to Sergio Aguero's opener on 24 seconds, but United hit back in the second-half, stunning City and rest of England's top flight. Salomon Rondon levelled on 66 minutes before Fernandinho's clumsy foul on Sean Longstaff in the area brought Tyneside to a standstill with 10 minutes remaining. And after the penalty was delayed due to the City goalkeeper receiving treatment - or checking to see where Matt Ritchie places his spot-kicks - Newcastle had lift off. Of course, Ritchie's successful penalty brought an almighty roar from the St James's Park-faithful - and club legend Shearer. The 48-year-old, Newcastle's all-time top goalscorer with 206, acted as a pundit for the Premier League's coverage of the game and nervously watched as Ritchie stepped up. And like Shearer did on so many occasions throughout his 10-year career on Tyneside - Ritchie thumped the ball past Ederson. "YEEEEESSSS" yelled Shearer, accompaied by former Arsenal striker Ian Wright, who found his reaction somewhat amusing. Shearer partnered Michael Owen up front when Newcastle had last beaten the Citizens, with Owen scoring the only goal of the game in September 2005. Watch the video above to see Shearer's reaction.